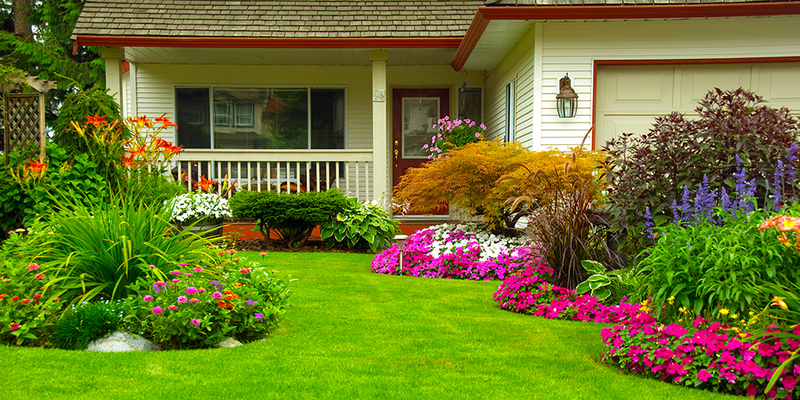 For a summertime seller, improving curb appeal is as simple as hiring a lawn crew and planting a few summer flowers. Within a few hours, you have a beautiful, attractive property just waiting to be snapped off the market. But in the winter? Curb appeal gets a little more complicated. Still, though the cold weather, intermittent snowfall and demands of the holiday season may pose a hurdle, there are plenty of ways to enhance your home’s visual appeal in the cold winter months. You just have to know where to look. It’s the holiday, so why not embrace it? Hang twinkling lights along your roof, line the yard and garden with tube lights, and trim your tree in the living room. You can even add a nice wreath to your front door and fill your porch with seasonal poinsettias to give the space a pop. Adding these holiday touches is a great way to make potential buyers feel warm, fuzzy and at home on your property – a must if you want them interested! Just be sure to leave the kitschy, little-kid décor at home. Sure, your little one may love Frozen, but lining your yard with Disney-themed inflatables isn’t the best way to boost your curb appeal to the average buyer. If you want to use these items, be careful to take them down before any scheduled showing. Keep your holiday décor classic, traditional and beautiful. 2. Change up your landscaping. While you certainly won’t have blossoming, springtime flowers and tons of foliage this time of year, there are things you can do to spruce up your landscaping in the colder months. For one, you could try xeriscaping – a landscaping method uses in drier areas, where rain is rare. Xeriscaped lawns require very little upkeep and are strong enough to withstand the cold snaps in the winter season. A big benefit? It cuts down on lawn maintenance costs in the long term – a huge draw for many buyers. If you don’t want to do a full overhaul of your yard, consider installing cold-resistant plants, shrubs and, yes, even some flowers. Boxwood hedges, holly bushes and winterberry bushes are all very seasonal, hardy plants, while camellias and snowdrops can add a floral element. Head to your local garden center for inspiration and to see what seasonal plants are right for your specific locale. You can also add new house numbers (bronze and brass are very popular right now), switch out your door handle and knocker to match, and add a new welcome mat just for good measure. If you have a little extra to spend, upgrading your door entirely or adding a smart doorbell are great ways to impress, too. 4. Repaint the exterior or add siding or shutters. Give your home a facelift by adding a fresh coat of paint – especially if it’s been a while since you’ve done so. You can also add (or upgrade) any siding, or add painted shutters to draw in the eyes and add some visual appeal. Try to think warm, welcoming colors that flow well with your door, your roof tone and any other elements visible from the curb. You want your home eye-catching – not an eyesore. Have a broken fence? A faulty gate? A fallen down tree or broken down garage door? Missing shingles or chipped and cracked siding? Make time to fix these issues and repair or fully replace all non-working items. Not only will these be a detraction for any potential buyer, but they’ll likely get noted on the home inspection too – and that could cost you money or a sale altogether. Selling Your Home this Season? If you’re selling your Schertz or San Antonio property this winter, contact The Claus Team today. Our local experts can help you improve curb appeal, market your property and find the perfect buyer in no time – cold weather or not. Call us today to get started.